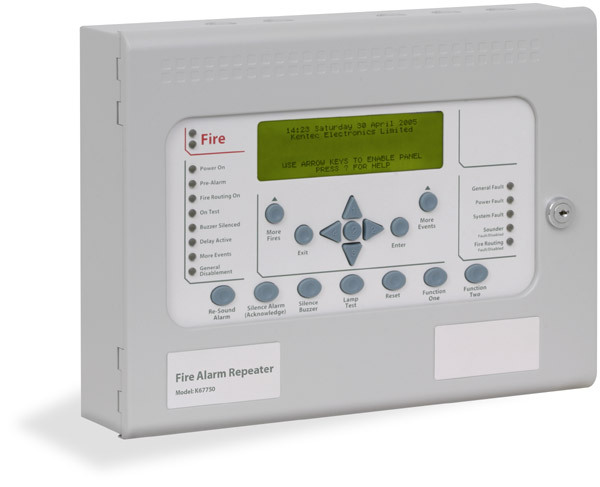 Designed and manufactured to the highest standards in a quality controlled environment the Syncro VIEW Marine fire alarm annunciator provides a simple and convenient method of extending the controls and indications of the Syncro ASM fire alarm control panel to other locations. The large, graphic liquid crystal display and high brightness LED indicators duplicate the indications on the Syncro ASM fire alarm control panel at up to 15 additional locations via a simple, two-wire serial data connection. The Syncro VIEW Marine is available in either a 24V DC powered option (which can be powered via an additional 2 cores from the Syncro ASM control panel, a maximum of 4 VIEW Marine Repeater Panels in this combination) or up to 15 VIEW Marine Repeater Panels if powered local from an ancillary 24V DC supply or a 230V powered option with local battery back up. Syncro VIEW Marine is housed in a small enclosure which is styled similarly to the Syncro ASM control panel and is ideal for installations where a large fire control panel would be detrimental to décor or where space is at a premium such as the Control Bridge or Helm. Up to 15 Syncro VIEW Marine annunciators can be connected to each control panel on the Syncro ASM network making VIEW Marine ideal where multiple points of indication and/or control are required in such as places as Engine Rooms, Staff Quarters, Living Spaces or Control Area’s.